One of my favorite anime films is the 1988 Hayao Miyazaki classic Tonari no Totoro. I spied this "20th Anniversary Commemorate Fan" in a shop in Tokyo and was overcome with glee. 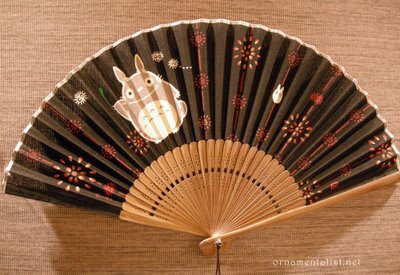 If you look closely, you can see in its design soot sprites, and even the cutout shapes of little totoros in the spokes of the fan. Wow, I love this! I totally would have snatched it up too. We LOVE Hayao Miyazaki's films...Sirited Away and Howl's Moving Castle are all time favourites from when my son was much younger but we still love to watch any of his work. We haven't seen Tonari no Totoro so one to look out for. Loks like you had a wonderful time in Tokyo. My daughter absolutely loves Totoro (and so do I). This is so adorable! I have to drag myself away from your blog to get some sleep...lovely stuff.